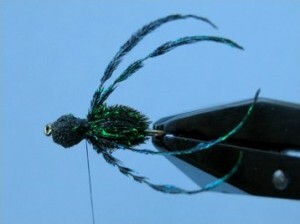 If I could only fish one type of fly it would have to represent any creature that shows a bit of leg! In fact the more legs the merrier! 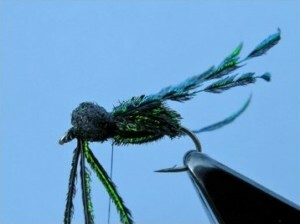 Daddies, water spiders, floating or sinking, anything with that enticing wiggle that Trout can’t resist. Fortunately angling history proves that my choice is a wise one. This floating fly soon achieved legendary status and sold in its thousands accounting for an equally staggering number of fish. 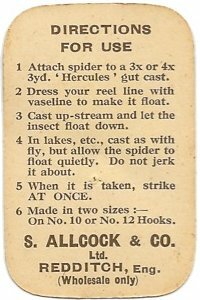 Attractively packaged in its own tin and mounted on an instruction card, it was keenly priced at 1/3d, making it almost irresistible to the fly angler. Today they fetch anything from £60 to £100 depending on condition. In October 2011 I made a film for the Sky Sports fishing show ‘Tight Lines’, where I managed to prove that this old stager is still a great fish catcher. 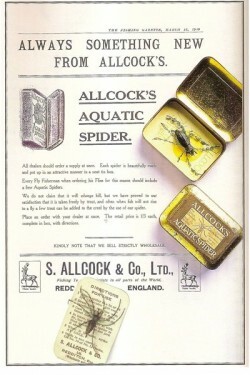 I didn’t use one of the original Aquatic spider flies as losing one or two would have been an expensive exercise! Instead I asked Stuart Bowden of Pendle Fly Dressing to tie me some exact replicas. He did a great job and the fish loved them! 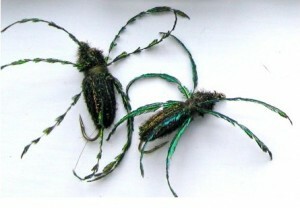 Since the show was aired I’ve had a great many enquiries asking how to tie the Aquatic Spider fly pattern, so here is my version with the step-by-step instructions. Let me know how you get on! Hook: Kamasan B830 or similar long shank. Thread: Fine. I use Sheer in black. Body: Veniard’s Booby Eye Foam. Black. Place a Kamasan 830 Size 12 (.or similar long shank hook) in the vice and run the thread down to opposite the barb. Now bring the thread two thirds of the way back up the hook and let it hang. 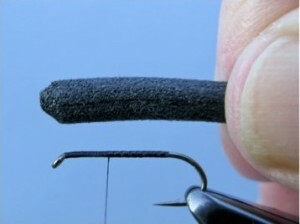 Take a section of 5mm black Booby-Eye foam and clip the front end to a blunt point. Measure the foam against the hook and trim it so its length is slightly shorter than the hook shank. Now trim the tail end of the foam to a gradual point. Take a pair of sharp pointed scissors and cut a shallow slit the length of the foam. 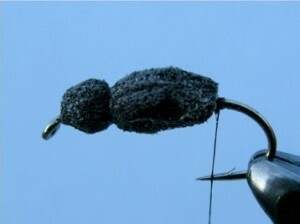 Spread a thin layer of Super Glue along the thread wraps and press the foam down onto the hook so it lodges in the slit. Be sure to leave a small space behind the eye. Wrap the thread around the foam forming the head and body. The body should be twice the length of the head. Whip finish over the wraps, snip the thread and reattach at the rear of the body securing the foam. 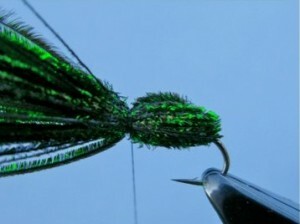 With the thread now at the rear of the body tie in 6-8 strands of Peacock Herl on top of the hook and the same below so that all the strands protrude both in front and behind the hook. Whip finish and reattach the thread behind the head. Grasp the herl strands that are facing forward and carefully tie them down behind the head making sure they are spread evenly around the body. Trim the waste. Now take the herls that are facing backwards and bring them forward to the same tie in point filling any gaps in the body. Tie down and trim the waste. 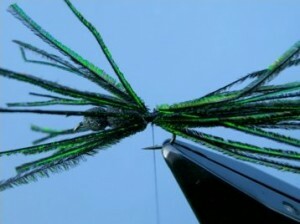 Tie in two pairs of Peacock Sword legs. One pair either side of the body facing backwards. When snipping pairs of sword herl from the feather it pays to leave them attached to the quill as this will help keep them in position when tying in. Trim the waste. 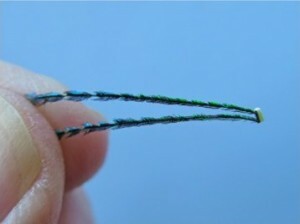 Move the thread to behind the eye and tie in three strands of Peacock herl, move the thread back to behind the head. Twist or plait the herl to form a rope, coat the foam head with varnish and wind the rope back to behind the head. Tie down the herl and trim the waste. Tie in a pair of legs facing forwards either side of the head. Trim the waste; add a little varnish whip finish. 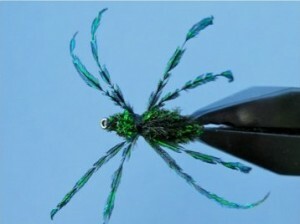 Next Next post: So You Want to Learn to Tie Flies?